Sean Fizer, Patrick Fleming, Grant Idlewine, Kyle Kelley from the Bellarmine University Physical Therapy Program's Pathophysiology of Complex Patient Problems Project. Demographic Information: Brandt Widelline is 52 year old Caucasian, female working as a Medical Laboratory Scientist. Medical diagnosis: Chronic Hepatitis C diagnosed 6 years ago. Patient was unaware of acute infection due to asymptomatic presentation. Patient medically diagnosed with hepatitis C hemotologically through positive HCV antibody testing. PCR testing confirmed chronic Hepatitis C diagnosis. Upon examination, Brandt Widelline reported constant fatigue and muscle aches throughout the day, accompanied by mild pain in her right upper quadrant. She also reports intermittent nausea. Her medical history shows that she has been diagnosed with Hepatitis C, Type II DM, hypertension (HTN), and alcoholism. A Fibro Test/Acti Test (FT-AT) was performed four years ago to determine the stage of liver fibrosis, which concluded a Metavir fibrosis score of 2, meaning scarring has occurred and extends outside the areas in the liver that contain blood vessels. The patient’s current treatment for the Hepatitis C and associated comorbidities consists of vitamin D supplements beginning 2 years after the diagnosis of Hepatisis C, Ribavirin, Sofosbuvir and insulin. She began treatment with pegylated interferon treatment two years the Hepatitis C diagnosis, which was a 48 week treatment, but it was replaced with Sofosbuvir beginning in January of 2014. The patient reported goals for her treatment are to achieve sustained viral responses (SVR) near 80%, weight loss to improve her quality of life, improve fitness and decrease fatigue, and decrease the risk of osteoporis. Self Report Outcome Measures: SF36 QOL measure: 29.0 physical health score; 36.5 mental health score; depression/anxiety, fatigue, flu-like symptoms, cognitive function, insomnia are the five key concepts looked at in this measure. Ms. Widelline presents with chronic fatigue and mild to moderate weakness in UE and LE. She had decreased AROM in B LE and tightness in her knee flexors and ankle plantarflexors that could be causing some of her muscle aches. She demonstrated B weakness in UE and LE, which could be associated with some of the fatigue she has been experiencing. She has decreased aerobic capacity with decreased walking distance, step length, and gait speed. Patient presents with chronic case of hepatitis C. She reports low QOL measures, as well as decreased cardiovascular fitness, strength, sensation, hip ROM, and community mobility and balance measures. She has been on a pharmacological intervention for 4 years for hepatitis C. Physical therapy intervention will focus on physical activity to increase CV fitness, strength, and balance measures. PT will also focus on educating Ms. Widelline on the symptoms and nature of Hepatitis C.
No vaccine or post-exposure prophylaxis is currently available. Thus main focus of management is prevention awareness. First 6 months (acute phase) patient was asymptomatic and thus, received no treatment. In the chronic phase, patient was prescribed Ribavirin BID, protease inhibitor (boceprevir), metrormin (Glucophag), Insulin glulisine (Apidra), vitamin D, which sustains the viral response. Diaphragmatic breathing techniques to help with SOA. Education on energy conservation techniques. Postural correction with anterior chest stretching and posterior scapular stabilizers strengthening. Pelvic alignment exercises, incuding posterior pelvic tilts and transverse abdominis activation. Balance and proprioception training was also required due to history of type II diabetes and low DGI and CBMS scores. Physical activity and education was also found to be helpful in QOL measures for the patient. Lectures on topics such as hepatitis and treatment, history of jaundice, and evaluation in sports medicine were provided as well. Patient did not report any symptoms (not yet diagnosed). Patient had c/o fatigue, unplanned weight loss, and diarrhea. Reports of intermittent itching and joint pain. Symptoms from preicteric stage still present, but reduced in severity. Palpation revealed enlarged spleen and post cervical lymph nodes. All symptoms reduced or absent, but reports of being easily fatigued. After 20 visits of physical therapy intervention, DGI and CBMS increased to normal values for her age group. QOL measure (SF-36) showed statistically significant improvements in quality of life. At 6 month follow up, patient reports continuing home-based exercise program and having increased tolerance to physical activity. The increase in QOL measure can be attributed due to decreases in pain and disability because of improvements in cardiovascular fitness and musculoskeletal function. About 15-45% of persons infected clear the virus within 6 months without medical treatment. The remaining 55-85% develop chronic hepatitis C infection (HCV). 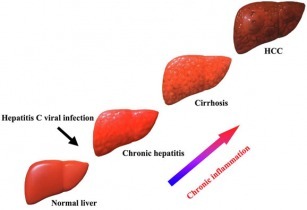 Those wich chronic HCV, have a 15-30% chance of developing liver cirrhosis within 20 years. 350,000 to 500,000 people die each year from hepatitis C-related liver diseases. Antiviral treatments are successful at reducing the risk of liver cirrhosis and cancer in 50-90% of persons treated. As of 2012, it is estimated that 21,870 cases of acute Hepatitis C infections occurred in the United States and 75-85% of these individuals develop chronic Hepatitis C. An estimated 3.2 million people in the United States have chronic Hepatitis C virus infection. As physical therapists it is important to not only look for the signs and symptoms of undiscovered Hepatitis C but to also work with a multiple-disciplinary team to insure best patient care. As direct access providers, it is important for physical therapists to thoroughly screen for systemic diseases that may mimic dysfunction or affect the musculoskeletal or neuromuscular systems. An understanding of the various signs and symptoms that present with Hepatitis C is important as it is estimated that 40-85% percent of individuals infected with the disease are aware of their status. Hepatitis C, unlike other forms of the pathology, is often undiagnosed due to the initially being asymptomatic. Minor flu-like symptoms are generally the first presentation of the disease. Other acute symptoms may include fatigue, decreased appetite, nausea, muscle and joint pain, inching, dark urine, abdominal pain, and jaundice. Medication side effects should also be monitored as this patient population may be treated for numerous co-morbidities; thus, this population may be using a variety of medications. In the clinical example, Mrs. Widelline was being treated for DM in addition to Hepatitis C. Medications used in the example such as Apidra, to treat DM, may cause weight gain, body aches and pain, and hypoglycemia. Theses are just a few of the many possible side effects of one particular medication. Though Hepatitis C is a medically treated disease, it is also associated with various co-morbidities including but not limited to diabetes, obesity, poor quality of life, liver disease, hypertension, and non-traumatic joint disorders. Many of these co-morbidities may have musculoskeletal ramifications that are within scope of practice for physical therapy to treat. While it is important for Hepatitis C patients to be treated medically by their physician, it is also important to treat the various effects the disease process may have on the musculoskeletal system. Patient education and improvement of lifestyle habits are paramount for quality of life for patients with chronic diseases such as hepatitis C. Medically appropriate hepatitis C patients are shown to improve quality of life through a physical activity program. Poll R. Screening for and diagnosing hepatitis C. Practice Nursing [serial online]. 2015; 26(1):22-26. Available from: CINAHL with Full Text, Ipswich, MA. Accessed March 18, 2015. Malnick S, Maor Y, Melzer E, Tal S. Chronic Hepatitis C in the Aged: Much Ado About Nothing or Nothing to Do?. Drugs & Aging [serial online]. May 2014; 31(5):339-347. Available from: CINAHL with Full Text, Ipswich, MA. Accessed March 18, 2015. Poynard T, Imbert-Bismut F, Benhamou Y, et al. Biomarkers as non-invasive assessment of hepatic fibrosis in chronic hepatitis C. Journal Of Gastroenterology & Hepatology [serial online]. December 3, 2004;19:S236-S245. Available from: Academic Search Complete, Ipswich, MA. Accessed March 22, 2015. HCV Diagnostic Tools: Grading & Staging a Liver Biopsy. HCV Advocate website. http://www.hcvadvocate.org/hepatitis/factsheets_pdf/grade_stage.pdf. Published October 2007. Accessed March 22, 2015. Sturm D, Gurevitz S, Davidson C, Fritchley A, Wagaman A. Chronic Hepatitis C Infection. Clinician Reviews [serial online]. November 2014; 24(11):24-32. Available from: Academic Search Complete, Ipswich, MA. Accessed March 18, 2015. McKenna O, Blake C. Management of hepatitis C: the potential benefits of exercise. Physical Therapy Reviews [serial online]. December 2007;12(4):271-276. Available from: Academic Search Complete, Ipswich, MA. Accessed March 21, 2015. Kleinman L, Mannix S, Yuan Y, Kummer S, L'italien G, Revicki D. Review of patient-reported outcome measures in chronic hepatitis C. Health Qual Life Outcomes. 2012;10:92. Available from: http://www.ncbi.nlm.nih.gov/pubmed/22871087. Accessed March 18, 2015. Rehab Measures: Dynamic Gait Index. Rehab Measures Web site. http://www.rehabmeasures.org/Lists/RehabMeasures/PrintView.aspx?ID=898. Published 2010. Accessed March 29, 2015. Rehab Measures: Community Balance and Mobility Score. Rehab Measure Web site. http://www.rehabmeasures.org/Lists/RehabMeasures/PrintView.aspx?ID=994. Published 2010. Accessed March 29, 2015. Khalsa JH, Elkashef A. Interventions for HIV and hepatitis C virus infections in recreational drug users. Clin Infect Dis. 2010;50(11):1505-11. Available from: http://cid.oxfordjournals.org/content/50/11/1505.long. Accessed March 23, 2015. Payen JL, Pillard F, Mascarell V, Rivière D, Couzigou P, Kharlov N. Is physical activity possible and beneficial for patients with hepatitis C receiving pegylated interferon and ribavirin therapy?. Gastroenterol Clin Biol. 2009;33(1 Pt 1):8-14. Available from: http://www.em-consulte.com/showarticlefile/198936/main.pdf. Accessed March 22, 2015. Goodman C, Snyder T. Differential Diagnosis for Physical Therapists. 5th ed. St Louis, MO: Elsevier; 2013. World Health Organization. Hepatitis C. http://www.who.int/mediacentre/factsheets/fs164/en/. Accessed March 26, 2015. Center for disease control and prevention. Hepatitis information for the public. Available at www.cdc.gov/hepatitis/c/cfaq.htm, accessed March 1 2015. University of Washington. Hepatitis C online. Available at http://www.hepatitisc.uw.edu/pdf/screening-diagnosis/epidemiology-us/core-concept/all, accessed on march 1 2015. Physiopedia. Hepatitis A, B, C general information. Available at http://www.physio-pedia.com/Hepatitis_A,_B,_C. Accessed on March 1 2015. Lebovitz HE. Insulin: potential negative consequences of early routine use in patients with type 2 diabetes. Diabetes Care. 2011;34 Suppl 2:S225-30. ↑ 1.0 1.1 1.2 1.3 1.4 1.5 Poll R. Screening for and diagnosing hepatitis C. Practice Nursing [serial online]. 2015; 26(1):22-26. Available from: CINAHL with Full Text, Ipswich, MA. Accessed March 18, 2015. ↑ 2.0 2.1 2.2 2.3 2.4 2.5 2.6 2.7 Malnick S, Maor Y, Melzer E, Tal S. Chronic Hepatitis C in the Aged: Much Ado About Nothing or Nothing to Do?. Drugs & Aging [serial online]. May 2014; 31(5):339-347. Available from: CINAHL with Full Text, Ipswich, MA. Accessed March 18, 2015. ↑ 3.0 3.1 3.2 3.3 3.4 Poynard T, Imbert-Bismut F, Benhamou Y, et al. Biomarkers as non-invasive assessment of hepatic fibrosis in chronic hepatitis C. Journal Of Gastroenterology & Hepatology [serial online]. December 3, 2004;19:S236-S245. Available from: Academic Search Complete, Ipswich, MA. Accessed March 22, 2015. ↑ 4.0 4.1 HCV Diagnostic Tools: Grading & Staging a Liver Biopsy. HCV Advocate website. 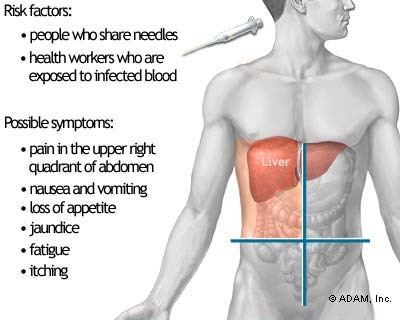 http://www.hcvadvocate.org/hepatitis/factsheets_pdf/grade_stage.pdf. Published October 2007. Accessed March 22, 2015. ↑ 5.0 5.1 5.2 Sturm D, Gurevitz S, Davidson C, Fritchley A, Wagaman A. Chronic Hepatitis C Infection. Clinician Reviews [serial online]. November 2014; 24(11):24-32. Available from: Academic Search Complete, Ipswich, MA. Accessed March 18, 2015. ↑ 6.0 6.1 6.2 McKenna O, Blake C. Management of hepatitis C: the potential benefits of exercise. Physical Therapy Reviews [serial online]. December 2007;12(4):271-276. Available from: Academic Search Complete, Ipswich, MA. Accessed March 21, 2015. ↑ 7.0 7.1 Kleinman L, Mannix S, Yuan Y, Kummer S, L'italien G, Revicki D. Review of patient-reported outcome measures in chronic hepatitis C. Health Qual Life Outcomes. 2012;10:92. Available from: http://www.ncbi.nlm.nih.gov/pubmed/22871087. Accessed March 18, 2015. ↑ Rehab Measures: Dynamic Gait Index. Rehab Measures Web site. http://www.rehabmeasures.org/Lists/RehabMeasures/PrintView.aspx?ID=898. Published 2010. Accessed March 29, 2015. ↑ Rehab Measures: Community Balance and Mobility Score. Rehab Measure Web site. http://www.rehabmeasures.org/Lists/RehabMeasures/PrintView.aspx?ID=994. Published 2010. Accessed March 29, 2015. ↑ 10.0 10.1 10.2 Khalsa JH, Elkashef A. Interventions for HIV and hepatitis C virus infections in recreational drug users. Clin Infect Dis. 2010;50(11):1505-11. Available from: http://cid.oxfordjournals.org/content/50/11/1505.long. Accessed March 23, 2015.